Science is about making connections. And these can often be made between the most unlikely concepts. Thus in the posts I have made about pentavalent carbon, one can identify a series of conceptual connections. The first, by Matthias Bickelhaupt and co, resulted in the suggestion of a possible frozen SN2 transition state. They used astatine, and this enabled a connection to be made between another good nucleophile/nucleofuge, cyclopentadienyl anion. This too seems to lead to a frozen Sn2 transition state. The cyclopentadienyl theme then asks whether this anion can coordinate a much simpler unit, a C2+ dication (rather than Bickelhaupt’s suggestion of a (NC)3C+ cation/radical) and indeed that complex is also frozen, again with 5-coordinate carbon, and this time with five equal C-C bonds. So here, the perhaps inevitable progression of ideas moves on to examining the properties of this complex, the outcome being a quite counter-intuitive suggestion which moves us into new territory. This suggests that the apical 5-coordinate carbon might actually be basic, and hence coordinate a proton to form a di-cation (below). So adding a proton results in the following stable (in the sense of having all positive force constants) structure, with apical C-C bond lengths of 1.7Å (compared to 1.8Å for the unprotonated system) and the bouncing castle/trampoline mode of 875 cm-1 (DOI: 10.14469/ch/2410) is likewise increased (for the pentamethyl derivative of the structure shown below). The apical C-H stretch has the highest value of all the CHs in the molecule, 3208 cm-1. The calculated proton affinity of the parent compound is 134.2 kcal/mol. To put this into context, we can compare this value with a range of first and second proton affinities reported for carbon bases by Frenking. The highest second proton affinity there reported (ie protonation of an already positive system) is around 106 kcal/mol, which is a good deal less than that found here! So we might conclude that our value must be a candidate for highest second proton affinity ever proposed for a carbon base. 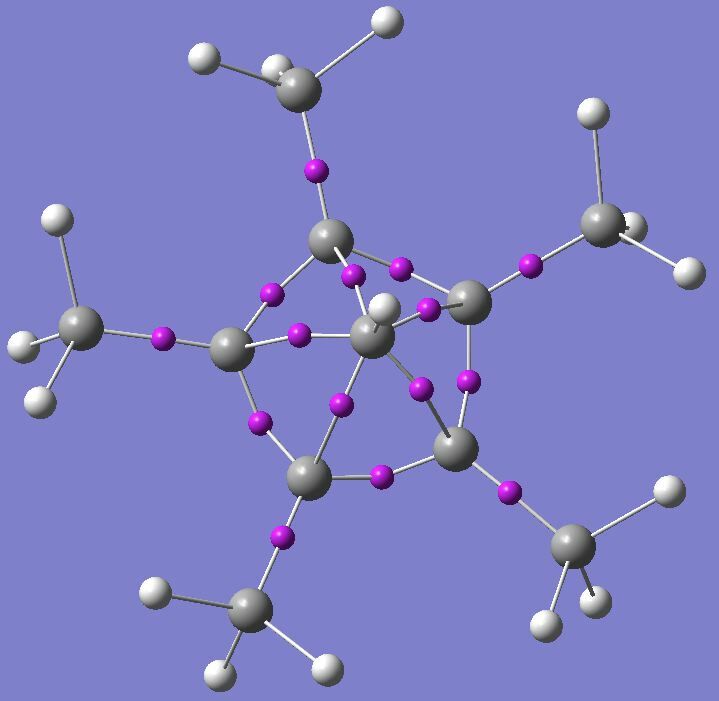 The value of ρ(r) for the AIM bond critical point located for each of the five apical C-C bonds is 0.156 au, again up from the value for the unprotonated species. As before, the Cp ring itself shows no ring critical point. 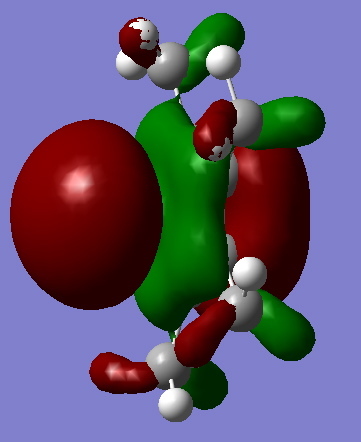 An ELF analysis (below) shows five disynaptic basins in the C-C bond region, with the basin integrating to 0.75 electrons each. Together with the electrons in the apical C-H bond, 6.09 electrons are associated with basins surrounding this carbon atom. Both the AIM and the ELF concur in describing this carbon as not only hexa-coordinated, but hexavalent (although the bonds are not the conventional two-electron type, but perhaps more akin to a six-centre-four-electron interaction). So I suggest that simple protonation of a highly basic cation has resulted in a six-coordinate carbon atom, which exhibits six strong bonds coordinated around it. I suppose it is inevitable again that one ends this post with the question whether this species too might one day be made. This entry was posted on Friday, October 2nd, 2009 at 11:08 am and is filed under Hypervalency, Interesting chemistry. You can follow any responses to this entry through the RSS 2.0 feed. You can leave a response, or trackback from your own site. Fantastic find! I was inspired by your last few blog posts to do some searching for unusual hypercoordinate species, like the methyl analogue of the above (replacing H with Me, though as the monocation) and related things and they all lead to either dissocciated species or more conventionally bonded molecules. I would suggest these posts be combined into a paper – and hopefully some progressive publisher will recognize the value of the science and the role the blog has played in pursuing this avenue. It’s Hexa-coordinate carbon Spock – but not as we know it! is licensed by Henry Rzepa under a Creative Commons Attribution-Noncommercial-Share Alike 3.0 United States License.